I finally checked out Amazon’s new MP3 music store today and have to say that I was pretty impressed. 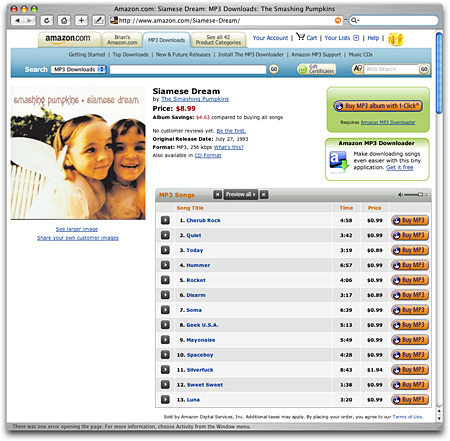 The main attraction of Amazon’s MP3 store is that all music, much like regular CDs, is DRM-free which means you can copy and share the music without technical restriction. (Of course, traditional music copyright and use laws still apply.) Another advantage is that most songs are $.89 per download, compared to the industry standard $.99, and most albums are $1-2 dollars cheaper as well. Amazon’s audio interface has also improved. Gone are the old Windows Media Player and Real Audio “listen now” links replaced with Flash audio playback which improves performance on all browsers without the need for extra plugins. The Amazon MP3 music selection is still small compared to iTunes due to the fact that the four largest record labels have yet to agree to release their catalogs without DRM but it’s a great start. And in fairness to iTunes, Apple has openly stated that they want to offer DRM-free music but it’s the major record labels that are blocking them from doing so. I enjoy the convenience of iTunes but from now on when it comes to buying music my approach will be to check Amazon first, then only buy from iTunes if what I am looking for is not available in a cheaper, downloadable, DRM-free format. PS – I’m still unable to buy “Crash” by Matt Willis from any legal source. This entry was written by Brian McNitt, posted on at 1:02 pm, filed under Music and tagged amazon, drm, mp3, Music, store. Bookmark the permalink. Follow any comments here with the RSS feed for this post. Post a comment or leave a trackback: Trackback URL.